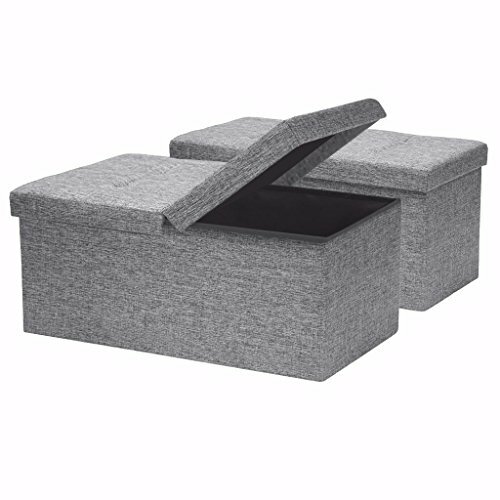 Otto and Ben 30-in SMART LIFT TOP Folding Storage Ottoman Bench Set These multi-purpose ottomans are bench, storage and footrest all in one! Padded with premium comfort foam, cushion top makes it comfortable for sitting while premium tweed fabric adds lush and modern look and feel to you interior. Features: Comfort Foam Padded Top: adds extra seating comfort Quick and Easy Folding: folds in flat and unfolds into a storage form within seconds Smart Lift Top: lid swings open on either side so you don’t have to clear the top every time you open. Tuft Design: adds modern and stylish delight to your interior Colors Available: Dark Grey, Light Grey, Brown Upholstery Material: Premium Tweed Linen Construction Material: Medium-Density Fiber Board (MDF) Product Size (inches) : ASEEMBLED: 30L x 15D x 15H INNER STORAGE: 28.5L x 13.5D x 13H CARE INSTRUCTIONS Spot clean, air dry. DO NOT use bleach. MORE DESIGNS AND SIZES AVAILABLE! Otto and Ben offers more designs, colors and sizes of folding storage ottomans. Click here to see more from Otto and Ben!. Smart lift Top: lid that swings open on either side, so you don't have to clear the Top every time you open it! If you have any questions about this product by Otto & Ben, contact us by completing and submitting the form below. If you are looking for a specif part number, please include it with your message.